Apparently my oldest daughter, Alex, has been sending harrassing emails to her cousins and aunts detailing how desperate she is for email (yes, just like her mom). This morning I came up for breakfast and she called me to her computer and said, "Look, mom, I got a whole lot of email." What a hoot! Aunt Voni obliged her little niece and must have sent an email to all her friends about Alex's desperate plea. Alex received a ton of email this morning from all these people she didn't know but said they knew Aunt Voni. It made her day! Eric and I were trying to carry on a conversation tonight on the way to Iowa City for our missions class. With Beth and Lucy loudly chattering in the seat behind us we had to stop over and over and shush them. They were role playing, as usual. These two do this thing wherever we are where they talk back and forth and play like they are someone either holding horses or barbies or bears. As we listened to them we heard them say, "You be vomit boy and I'll be barf girl." Then they had some protector characters they added into their little story that had all kinds of swords and pistles warding off the bad guys. Ok, first of all, what happened to my sweet little innocent girls? They're only 5 and 6! We thought that our life would be filled with princesses and glitter but in reality we've got vomit boy and barf girl. Where are they getting this crazy stuff? I flashed Eric a grin and we both chuckled quietly to ourselves in the front seat. Thanks God for giving us a reality check and for blessing us with our not-so-normal girly girls! Oh, and speaking of thanking God...I actually found a dress for this shin-dig in a couple of weeks. I paid $20 bucks for this thing. I have to hit the Y every day and work out extra long in order for it to really look great for the wedding but hey, Eric likes it and I'll only have to wear it once. I've searched all over online for a decent dress for this upcoming wedding. NO LUCK. I might wear a trash bag and add some hot jewelry and some really stylin' shoes and be done with it. The only problem with that simple idea is that I'm a candle lighter and torching myself on fire (since trash bags are fairly flamable) wouldn't really make the wedding more exciting in a good way. I haven't blogged for a few days because life has been going fast and I am growing weary of the fast lane. Maybe I'll get some good pictures of the kids tonight and post them. We had an extra kid here today all day and he walked into the office and said, "Wow, this room with all the computers in it is really messy." I thought for a minute and then I said, "Yeah, I was trying to go through all the receipts and do my taxes but then Beth and Lucy started participating and it wasn't fun anymore." Since the kid is 3 he didn't quite get my humor about the taxes being not so much fun in the first place and even less with little people helping. So, once again I laughed at my own joke just to keep my sanity in check. I sat on the couch with Eric on one side and a nice rolling fire coming out of our fireplace on the other side. It was -5' and brutally cold. We were watching a documentary together as a family and Lucy was sent to her room because she couldn't sit still and be quiet. My sniffer started noticing a smell distinctly different from the fire. I waited a bit and then realized I was smelling matches. I quickly got up, Eric thinking I was nuts, and walked through the house trying to find the smell. As I entered Lucy's room out of the corner of my eye I saw a little person dive under the bed. The smell was now extremely potent and I saw a small litter of matches lying on the carpet. We moved the bed to get Lucy out from under it and realized that she had gone through a whole box of matches. The damage was much smaller than it could've been - God was really watching over that little turkey! There was a burn in the carpet in front of her dresser and a pile of matches in my bathroom that had been lit. I left Eric to the discipline and explaining why this was not cool. Later Eric told me the reason she smelled so much like smoke on her person was that she held a match to her hair to see if it would burn. Lucy has some angel in heaven working overtime during her childhood years. Thank God! Bethie (top) - smothered in amongst pillows in a fetal position. She's the most sick. Lucy (left) - taking a break from running around doing her "exercises" she turns into a TV junkie. Every time I chase her away from the TV I catch her in a different room hiding out watching TV again. Alex (lower left) - Yes, mini-me, writing letters when she's not feeling good. Jake (lower right) - said he was not feeling well. Couldn't finish his homework but I "caught" him reading in his bed when I went to check on him. Sneaky snake! Most kids today are bouncing off the walls at home today in this state because a big ice storm came through during the night and this morning. (Feels like Kansas!) But, my kids are all sick. They were a little disappointed that they were sick and couldn't take advantage of staying home from school for a "snow" day. I took Beth and Lucy into the doctor this morning to get checked and ended up having Alex checked too. Came out of there with a high pharmacy bill and a nice size co-pay from the clinic. Here's the deal though. Medicine is supposed to sedate most kids but no, my little angel Lucy seems to take this stuff and it makes her wild. I don't mean just a little wild but running up and down the halls at the clinic wild. I mean jumping around, pulling open and closed the curtain and playing with the blood pressure machine while I'm talking to the doctor wild. Yes, it was a fun trip to the clinic. And, the kicker to the whole event was when we got home and the only "well" child I have said he felt sick. Well, Big E isn't known for his romantic side. He has never been good at gift giving at birthdays or Valentine's or any other day for that matter. (Yes, my friends and family are now laughing out loud at this truth, especially my sister!) But, I believe the time has come for this man to finally get credit for having a creative spirit on Valentine's day. Let me unravel the unbelievable evening I experienced last night. I went to pilates the minute he walked in the door and he said, "so, anything for supper?" I looked at him and got in his car and drove away. My expectations for this day are usually zero. Apparently, in the hour and a half I was gone he feverishly made a wonderful spread of mesquite beer marinaded chicken and peas. 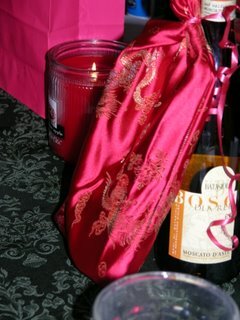 AND, he took some of the red silk he brought me from China and made a small little gift bag. He sewed it himself! He had a nice little card and a chilled bottle of wine at the table. The picture shows the cool wine and gift back attached. 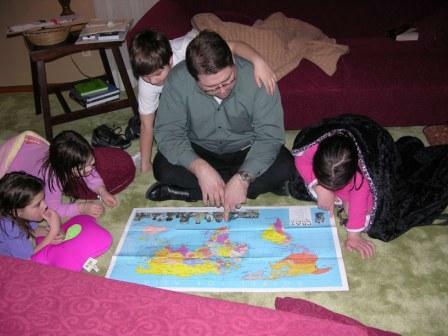 When I got home we ate supper as a family and I opened all the presents from Eric and my little people. Inside the handmade gift bag there was some foot cream. The funny part was that on the way home from Pilates I had gone by Hyvee and gotten a bottle of wine and had already bought some warming massage oil. The even more funny part of the night was that I was perfectly content drinking my wine alone (don't worry, only happens on Valentine's day) in my room while he was up in the office preparing for a big presentation today at work. It was the best Valentines day in all the 13 years we've been married and pretty close to a couple of those during the 3 years we dated. I really wish I had pictures of this stuff but my descriptions will have to do. Eric was in charge of the kids today and he had an extra kid to boot. He met me at church tonight and was actually there early. He said to me, "Don't worry, I just let Beth and Lucy pick out their own clothes. I decided not to get involved." He added that that was why he was early. As we chatted with Eric's friend, Eric (yeah, same names and they think alike too!) before the service it all came out that when my Eric dropped Lucy off in her classroom he noticed she was wearing the famous Buller crack out the back of her pants (yes, this trait usually just runs in the male side of the family but there it was!). She also had a shirt on that seemed to be last year's make and model. He joked that Beth was RED, red, and a little more red. Oh, and sparkly. I thought about this all through the service wondering what the heck he brought them to church in. I cracked up when we left church as I caught a glimpse of it all. Lucy had on a turquoise ruffly shirt that was so small on her that her belly was hanging out (and yes, the crack was showing too). The navy blue pants she tokened the outfit with were also a size too small. No socks (30 degrees here), high heels. Beth was wearing a really neat red dress she acquired from a favorite cousin. She added to the silky dress by wearing red, black, orange and yellow silky tights with about 4 holes down the legs and sparkly red "Wizard of Oz" shoes. She was very red. I know this stuff is totally superficial but I cracked up nevertheless. I guess the point is that all the kids were alive after spending the day alone with dad, we were able to return our friend's kid in one piece, and the girls wore their outifts with a certain pride having picked them out themselves. They don't need me after all. They could get along fine with dad. This is Bethie, kid #3. 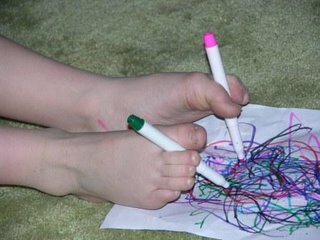 I was walking by her and she said, "Hey mommy, look, I'm using my toes to color this picture!" Eric happened to be walking by the other way at the same time and I caught his eye and we both couldn't hold back the smirks and giggles. She was so serious about it too. This girl can not only draw quite well but now it has spread to her toes. 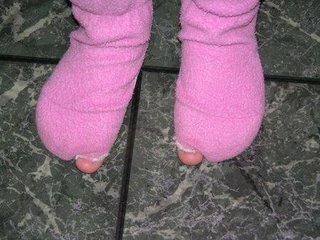 Her father's toes have always bothered me how they are long and move all the time (I am NOT a foot person) and now there is some real talent being passed down in those silly toe genes. Watch out for these Buller kids when they grow up! Their talent is abounding! Last night I was praying with Alex, Beth, and Lucy and I was almost finished when Lucy bit my arm and then pinched me. I was so stunned. Sometimes I think that I must be in a dream and the stuff that goes on around here is too unbelievable. Someone should just pinch me and wake me up. AND, when I think the most unbelieveable thing happens and can never be topped, another scene plays out and I am again taken aback. Tonight we were all scurrying around trying to get going to AWANA. Beth and Lucy had both stripped down to put on dress up clothes so when it was time to leave no one could find their day clothes. Eric and I reminded them several times to get dressed. Finally, Eric went down to find them. Soon after Bethie comes upstairs dressed and says, "Mom, you're not gonna believe this." I looked at her thinking, sure I will, try me. "Lucy just peed and pooped on the floor in the laundry room, just like the dog." Again, I was stunned. Couldn't she have just used the bathroom just across the hall? What is that girl thinking? Tonight we started this new book about kids in other countries and this thing called the 10/40 window. We tried foods from other cultures and had a ton of fun together. Eric is showing the kids the window and they're totally excited. Lucy kept running into the kitchen and stealing food but as you can see here, she likes to be in pictures and when I got the camera out she decided to start paying attention! Our weekend was crazy full. We visited a church in Mennonite country and had a really great time meeting new friends and learning about these cool missionaries who lived in Ecuador for 37 years. I just absorbed all their information and could have stayed for a long time. The people who had invited us lived down the street from their daughter who had a fun house to visit. Their daughter took all our kids over there and when we went to get the kids to go home we couldn't find Lucy. We noticed the bathroom door was closed and I opened it but she wasn't in there. Wait! I hadn't checked the shower! Lucy was hiding in these people's shower, whom we had only met earlier that day, and she was cowering against the back wall with her eyes tightly shut. I guess she thought if her eyes were closed I wouldn't see her. She really didn't want to leave either! She loves these pajamas and just won't throw them away! Sometimes the baby gets away with a ton.